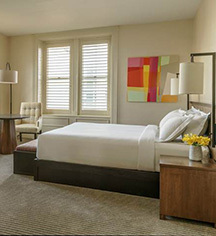 Guests of The Bellevue Hotel will find themselves in the most spacious, contemporary hotel guestrooms and suites in all of Philadelphia, and take in beautiful views of the city skyline and vibrant Center City streets. Here, luxurious lodging is taken to new heights, with contemporary décor evoking the very best of the city. Standard Rooms - with one king-size or two queen-size beds, city or conservatory views. 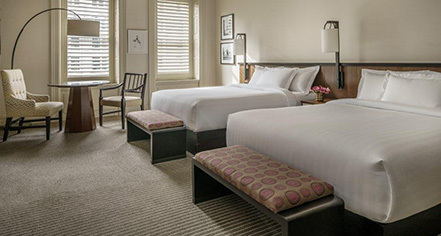 Deluxe Rooms - with one king-size or two queen-size beds, city or conservatory views. Cityview Rooms - with one king-size or two queen-size beds, high floor city views. Junior Suite - with one king-size bed, studio style suite, balcony facing atrium. Avenue Suite - with one king-size bed, 559 square foot parlor suite, with city views. Conservatory Suite - with one king-size bed, 559 square foot parlor suite, with atrium views. Bellevue Suite - 831 square foot suite with plenty of natural light, an elegant separate living room, marble entrance foyer and beautiful city views.